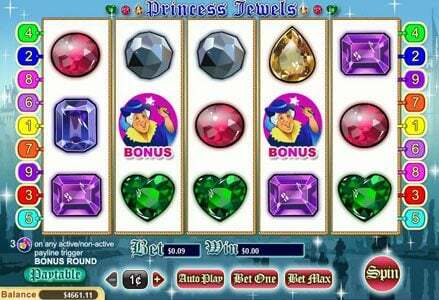 Slot review of Princess Jewels slot created by WGS software with 9 lines and 5 reels. 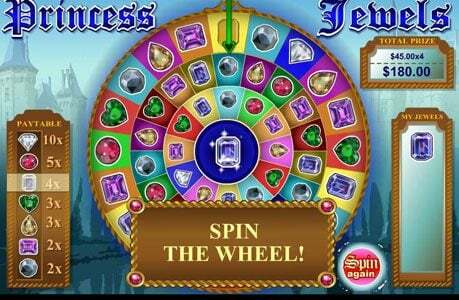 Princess Jewels Slots has not been reviewed yet, be the first to rate this slot. Princess Jewels Slot has 5 reels and 9 paylines. The designer of the slot is Wager Gaming, a company that included in it a major jackpot of $100,000 plus scatter and wild symbols. 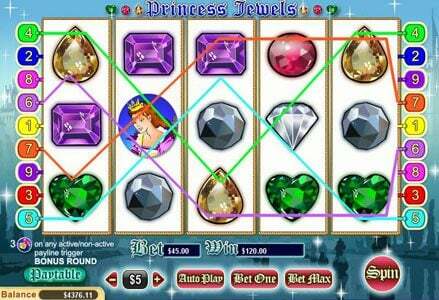 It’s a slot that will appeal to women mostly, the princess theme and the jewels being the focus for it. In the background of the slot, you can see the castle grounds, with the lake in the middle and the trees on its margins. The reels are simple, with symbols using images of the princess, the fairy godmother, plus four different types of jewels (diamonds, amethyst, sapphires, rubies and a few others). The two characters are also the ones that have special functions in this slot. Those that want to try this princess themed slot can bet up to $90 on a single spin, at least that’s how much they have to wager on the 9 paylines, at $10 per coin, if they want a chance at the top jackpot of $100,000 (10,000 coins). If they’re satisfied with smaller prizes, they can select a coin size or bet size that starts at $0.01. I’d recommend the full amount though, at least if you’re serious about making money from slots. 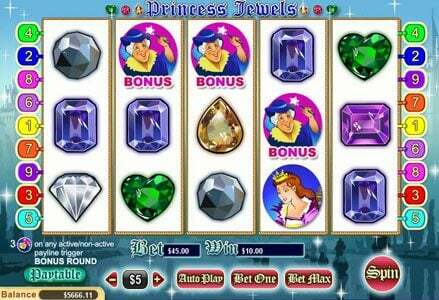 The wild symbol is the one that awards the top jackpot as well, and it’s the princess that has the honor in this slot. While acting as a wild, it will substitute for the other symbols that are needed for winning combos to be formed. 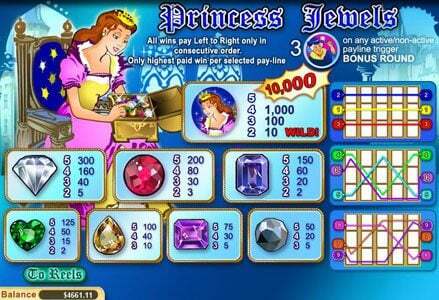 As the jackpot symbol, five princesses have to occupy one of the active paylines, in order for the 10,000 coins to be awarded to the player. The other character, the fairy godmother, which is a scatter symbol, will trigger the game’s bonus round. Three of these symbols are needed, and they can appear in any position, not necessarily on the same payline. During the Bonus round, the player can spin the wheel for a total of three times, each time getting a different multiplier value, which is used together with the initial bet. The resulting amount is awarded to the player at the end of the game. The AutoPlay option is available in this slot, as is the case in most of the Slots created these days. 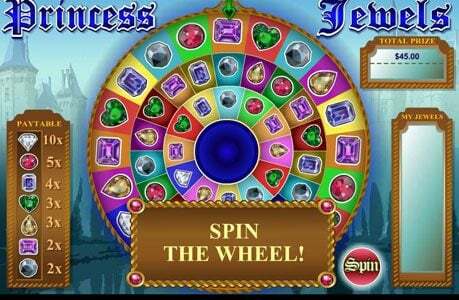 The game can be directed to play automatically for a certain number of spins, allowing the player to do something else in the meantime. A decent slot overall, with a target audience that is quite clear. Try it out if you enjoy the graphics, it’s a decent slot as far as features are concerned.